This was an excellent comprehensive day trip, highly recommend. This tour was my introduction to African animals prior to doing an overland tour. I was blown away by the animals and how close you could get to them in all locations. The elephant orphanage was fabulous and the baby elephants were very cheeky - spraying muddy water everywhere even over the spectators! 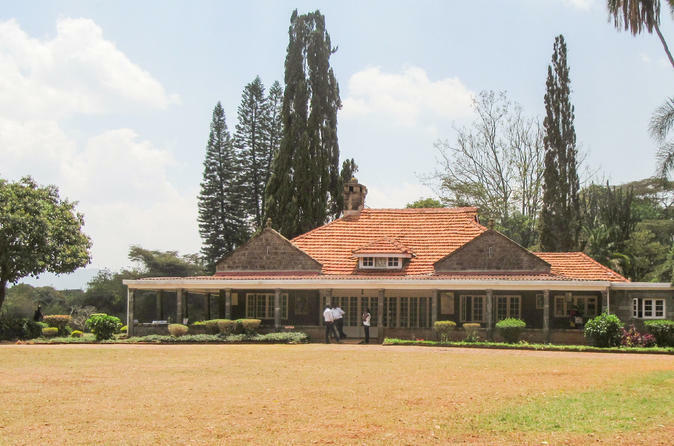 I skipped the Karen Blixen Museum in favour of Bomas of Kenya which I loved. Those who went to the museum were not too impressed so I was glad I chose Bomas! This was such a fun day! I enjoyed the Giraffe Center and Elephant Orphanage the most. You get to see a lot of major sights in Nairobi in a short period of time, which was great! Also, our driver/tour guide was incredible -- he was extremely accommodating. He also assisted with getting to my final destination on time. I would highly recommend this tour! We enjoyed this day of activities immensely, starting with the national park we were surprised at how many animals we saw, including a rhino. The elephant orphanage was interesting, great seeing the successful Kenyan conservation and education efforts in action. The baby elephants has such characters and we enjoyed watching them feeding and playing. The giraffe center was fun, we fed some greedy giraffes but also learnt much about these interesting creatures. We didnt end up going to Karen Blixen, instead went for lunch with our guide at a local recommendation which did some of the tastiest Kenyan food we had all trip. Our guide was great, had many laughs with hin throughout the day. He was very engaging and informed on all the places we visited as well as giving us an insight into Kenyan life. Highly recommend having a day in Nairobi with him to see the sights and learn about Kenya. When I planned this trip I had no expectations, no one I knew had ever been, it was a clean slate. Im having the time of my life and my safari hasnt even started yet. The people are wonderful, and not just because its their business to be polite. I booked this tour because I had scheduled a few extra days in Nairobi before my safari to the Maasai Mara and this seemed to hit all the high points and was an efficient use of time. The driver Douglas was terrific, very helpful, informative and we had a very small group of 3. I had a wonderful day and would do it again. It was excellent. Very good driver and listen to the customers proportion. It was a very good tour. I was picked up at my hotel at 6:30 am and I was back to my hotel by 3 pm. Admission fee to the 4 facilities is not included. A credit card is needed for the Nairobi National Park. Cash can be used at the other three facilities. Our driver/guide was friendly and spoke English quite well. We spent 3 hours in the Nairobi National Park. I was impressed with the variety of wildlife encountered which included lions, zebras, rhinos, water buffaloes, ostriches, wildebeests, gazelles, warthogs, hippos, and various types of birds. We spent one hour at the Elephant Orphanage and saw plenty of baby elephants. We spent one hour at the Giraffe Center where we fed the giraffes by hand and learned about the three different types of giraffes. We also spent about an hour at the Karen Blixen Museum which gave a glimpse into life during colonial Kenya. This was a great way to see Nairobi in one day. The guide was pleasant but very quiet and didn't freely offer up information when in the National Park--we had to prompt for knowledge about the animals that we were seeing when we did ask, he was very knowledgable. We also ran out of time, so we had to make a choice between Karen Blixen and the Boma's of Kenya, rather than being able to to both. 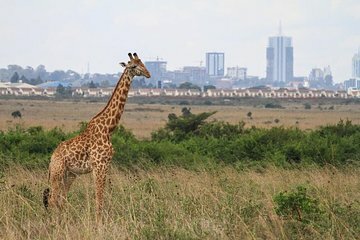 The National Park, David Sheldrick Orphanage and Giraffe Centre are all excellent attractions--and are highly recommended if you visit Nairobi. I had read all the other reviews of the tour so was prepared to have to pay all of the entry fees, but note, that you do have to do that. The National Park doesn't take cash so you need to make sure you have Visa or Mastercard with you to pay this fee. Lunch was at a restaurant with a fixed menu, it was tasty but there was limited choice, when with a group though this is a practical option. Overall, it was an enjoyable day and I would recommend this tour. The actual locations Nairobi National Park, Elephant Orphanage, Giraffe Center, and Karen Blixen Museum are worth the visits, and I would highly recommend that you go to see them. However, paying a tour company to arrange these visits is highly unnecessary because your Viator payment DOES NOT INCLUDE park fees nor does it include lunch. The only value added by our tour guide was his friendliness, and at the Nairobi National Park where he drove us around and was knowledgeable about the varied animals. However aside from the Nairobi National Park, he was simply a driver for the other locations. We bought our own tickets and navigated the Elephant Orphanage, Giraffe Center, and Karen Blixen Museum using the location tour guides each location have their own internal tour guides. To make things worse, our guide was 1 late for our initial pickup in the morning tour was supposed to depart pickup location by 6am but he didn't arrive till well past 7am, and we officially arrived at the first location Nairobi National Park to start the tour at 8am, 2 we were late to our 2nd location i.e. the Elephant Orphanage which ends at a fixed time, 3 it would have helped to have gotten a good sketch of the day ahead of time, so that we could have helped keep ourselves and the guide on track with timing to arrive at the locations. My recommendation is to arrange a tour for the Nairobi National Park only. Use Uber / private transport to get to the other locations. 125 is a bit hefty to pay for a day driver.